Passion for the Fashion, part II: The Accessories. 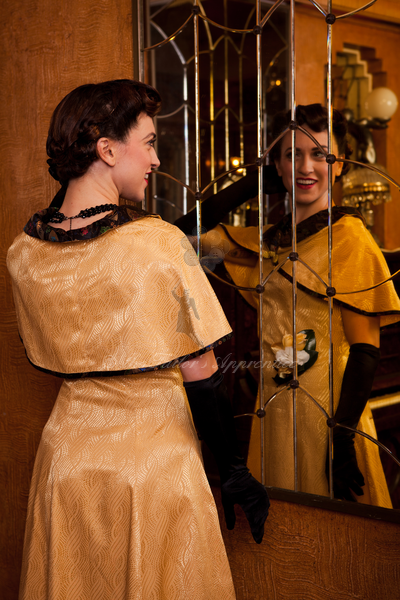 My first post about the 1912 Afternoon Wrap from the VPLL website Titanic Sewing Project talked about how I came about making the wrap. This post is about how I dressed it up a little to be able to wear it at the Titanic Dinner we are going to at the Fairmont Chateau Laurier here in Ottawa. The Chateau is commemorating the Titanic disaster because the man responsible for its existence, Mr. Charles M. Hays, was supposed to be at the opening ceremonies but he died on the Titanic on his way back from London, England. They had to postpone the special ceremonies for over a month. My husband surprised me on Thursday morning with reservations for the Titanic Dinner! The dinner is on Sunday evening! What to wear? what to wear? Not in a panic but simply which hat shall I wear? 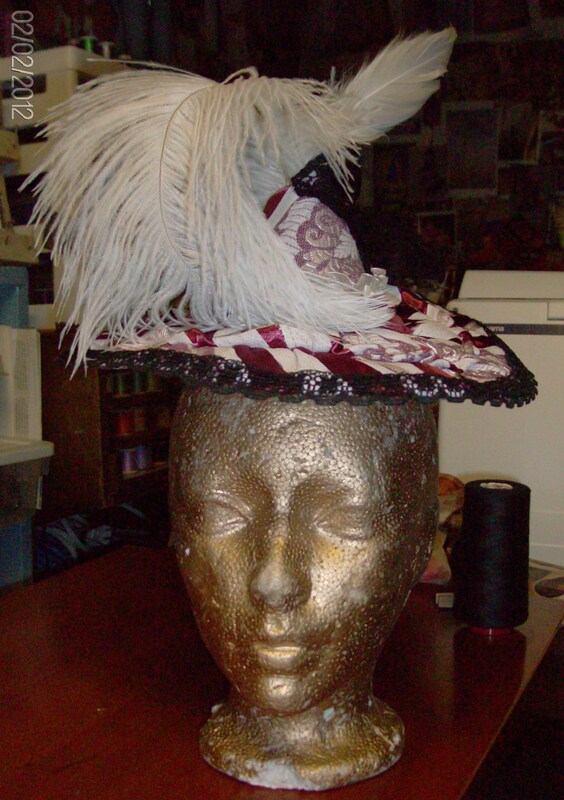 I recently made quite a few 1912 or thereabouts hats. What outfit? 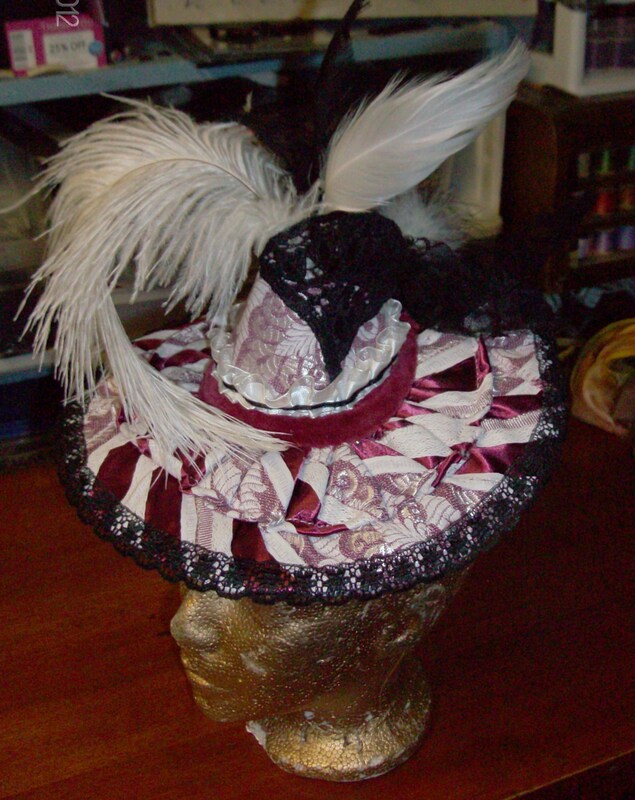 I wanted to wear my newly made Easter hat and a matching gown I would make that day but after consulting with the Ladies from the 1912 Titanic Sewing Project on Facebook, I realized that hat is simply not right for a dinner. 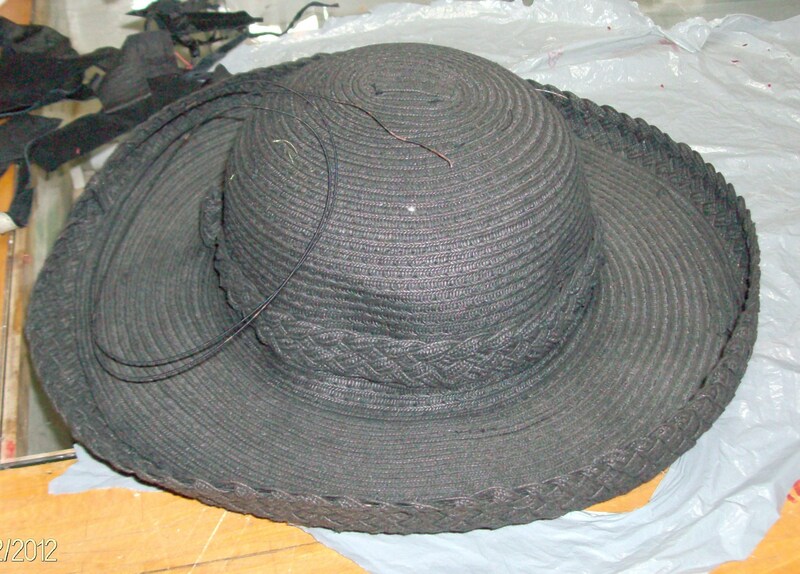 It is an afternoon hat or a luncheon hat… NOT a dinner hat. 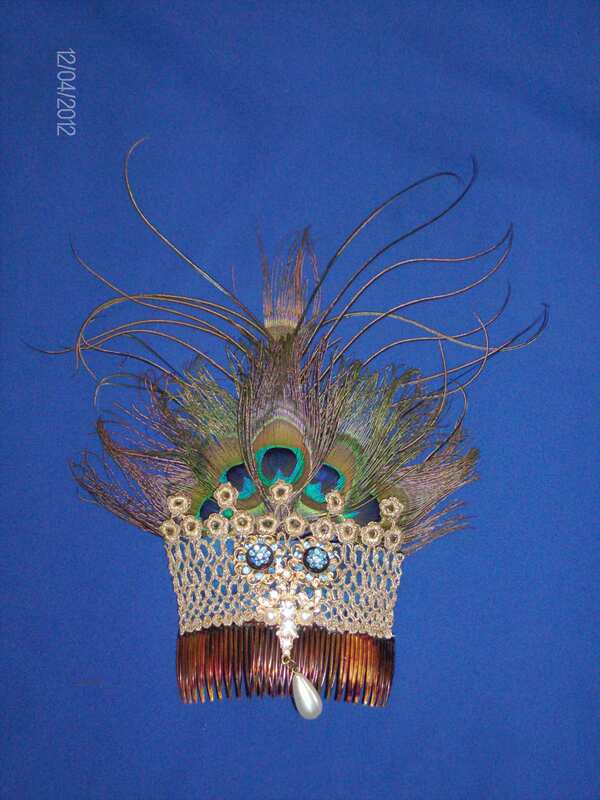 A hair ornament with feathers and or ribbon and or tulle and any mix of the previously mentioned would be better. So I set out in search, again, for suitable materials to make the hair ornament. I picked out some antique metallic lace, a couple of brooches, feathers and of course a comb, as this ornament should sit in some kind of *updo*. There were many types of feathers and I decided on peacock after observing that certain feathers have more blue which perfectly matched the blue of the Afternoon Wrap and its skirt. The skirt I already made about 4 years ago and is a very long and full flowing skirt. In order to hide some of the discoloration of the metallic thread and also because I wanted to narrow down the piece of lace to fit my wide comb comfortably, I folded over the two ends and sewed them tightly into a strong support for the feathers and brooch I intended to add to it. It looked lovely but didn’t show up very well. 😦 So I added a piece of the blue satin behind the lace and sewed them together at the edges and a little throughout the lace to make it sit flat. After that I sewed on the brooch which I assembled from 3 brooches: I found two very small pins with blue rhinestones that were the right match for the blue and the gold was a good match for the gold on the pendant pin. 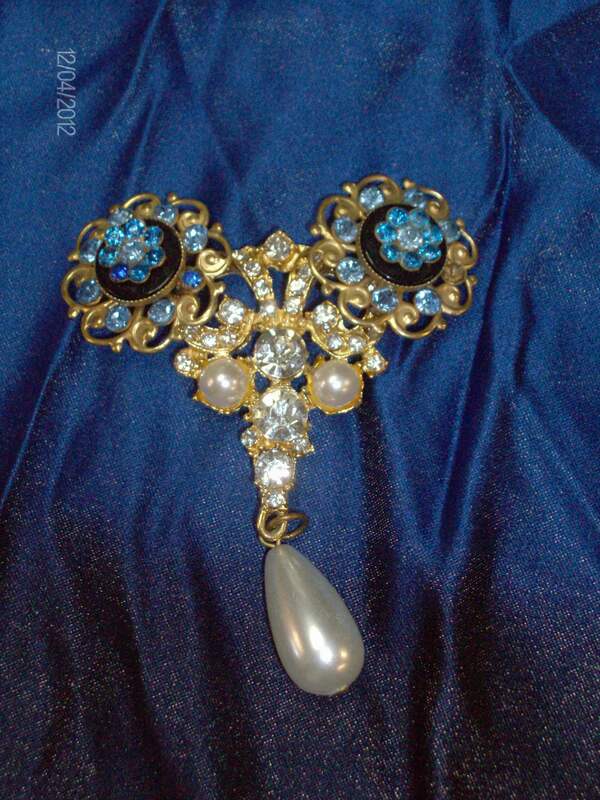 The bigger brooch has a large drop pearl dangling from it. It appealed to me! 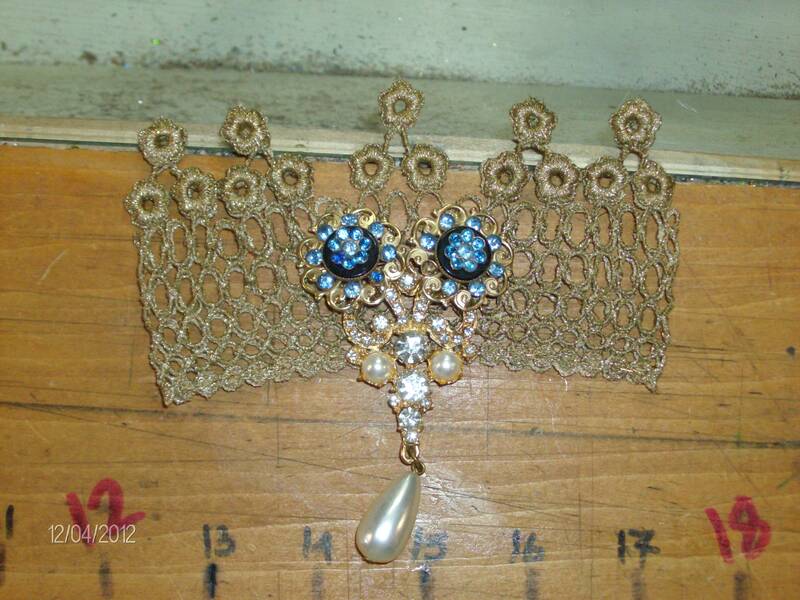 Once the brooch was solidly attached to the lace/fabric background it was time to add the feathers. Many ideas were considered…. 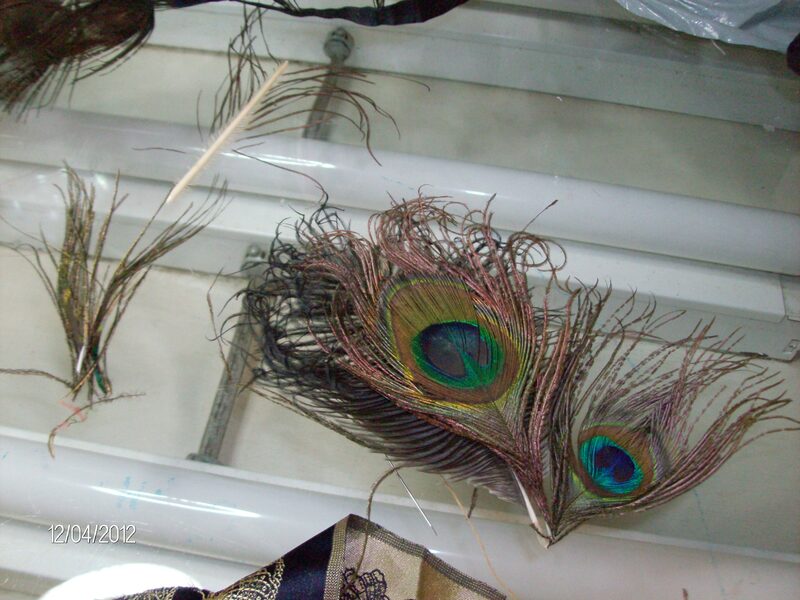 and after a long while I chose 5 peacock feather *eyes* and use the stem of a very long plume without its ornate end to have some cascading long *stalks* floating behind the smaller and lower row of *eyes*. Steaming the feathers after arranging them makes them stick together properly again. My comb was finished by the end of Thursday and met with many of the Ladies’ approval. All evening though, I kept on thinking that although the outfit looks very nice, it isn’t really appropriately *evening* in spite of it being satin. The main problem with it is that the skirt is so much fuller than what would have been worn in 1912. 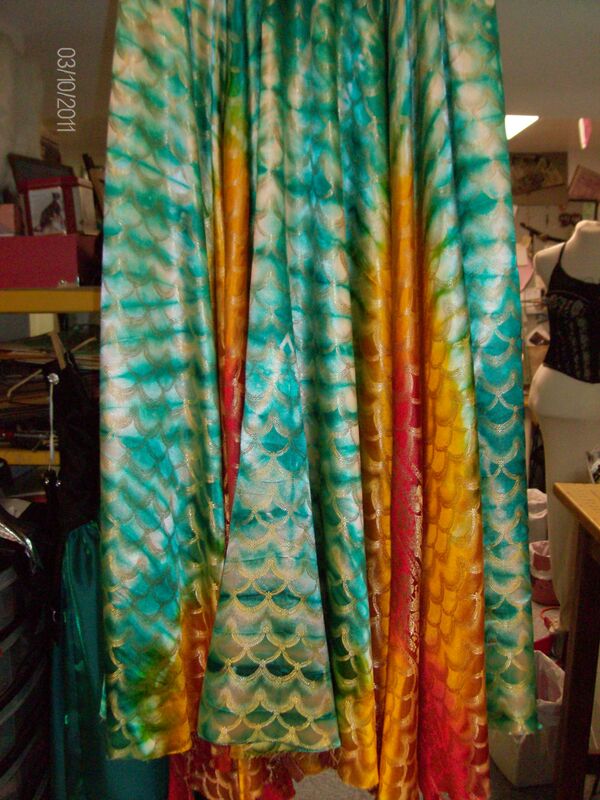 I didn’t have enough matching fabric to make a new narrow skirt nor was there anything in my stash that looked right with it. 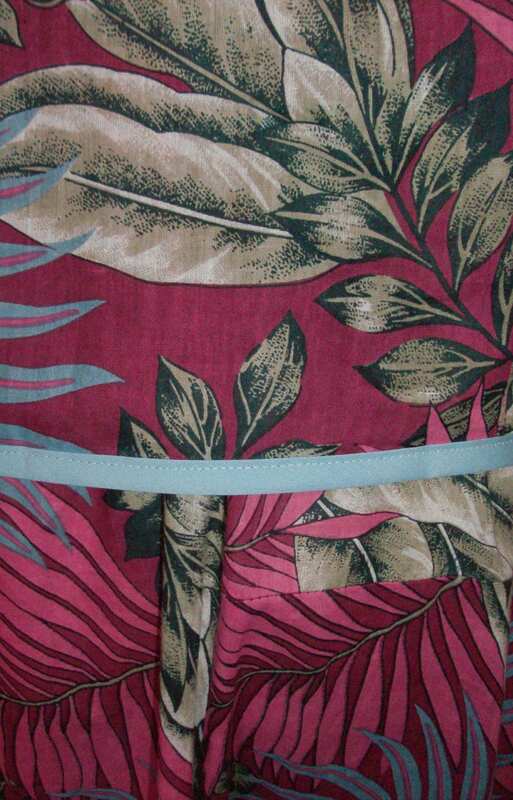 Besides, I like the butterfly border on the skirt: it obviously works well with the same border used as a belt and the back design for the Wrap! 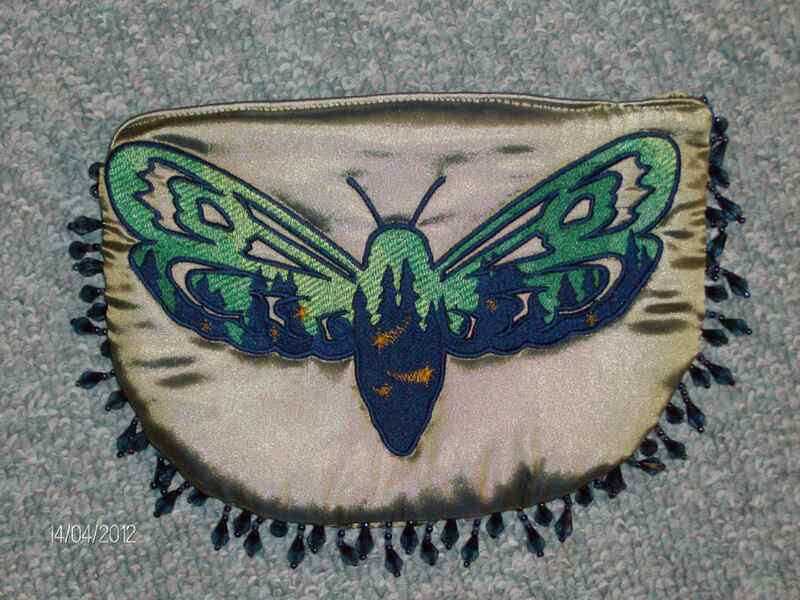 I also had a handbag on my mind… I didn’t have anything in the right colours to use for a period dinner… I went to bed deciding that I would embroider a butterfly on a remnant of the blue satin and make a small clutch with it. The plan was in my head, I was able to get to sleep! hahaha!! My morning on Friday was busy with serious appointments and visits… I had to wait for the afternoon to get back to my outfitting!!! I set upon the embroidery work and by the end of the day I had two panels of embroidered fabric ready to make into a bag. 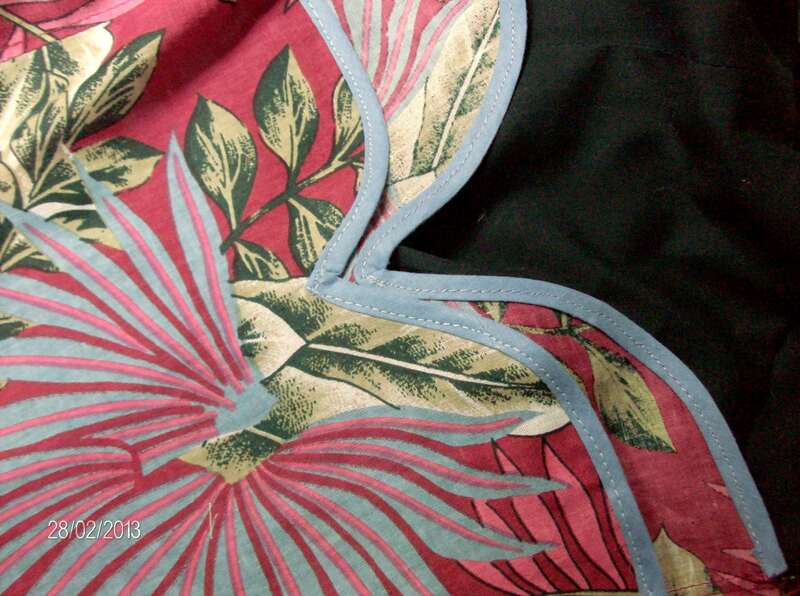 Even though this is machine embroidery, it takes several hours to get two embroideries of this size done. 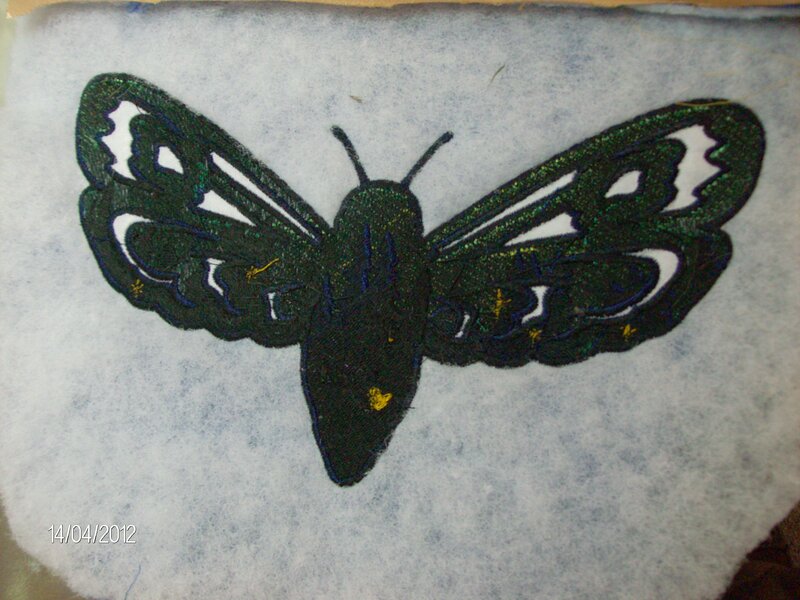 I embroidered a butterfly design which is almost the same butterfly as on the fabric’s border on one panel, using the wrong gold side of the fabric as its background, and a moth with a sunset scene in its wings for the other panel. 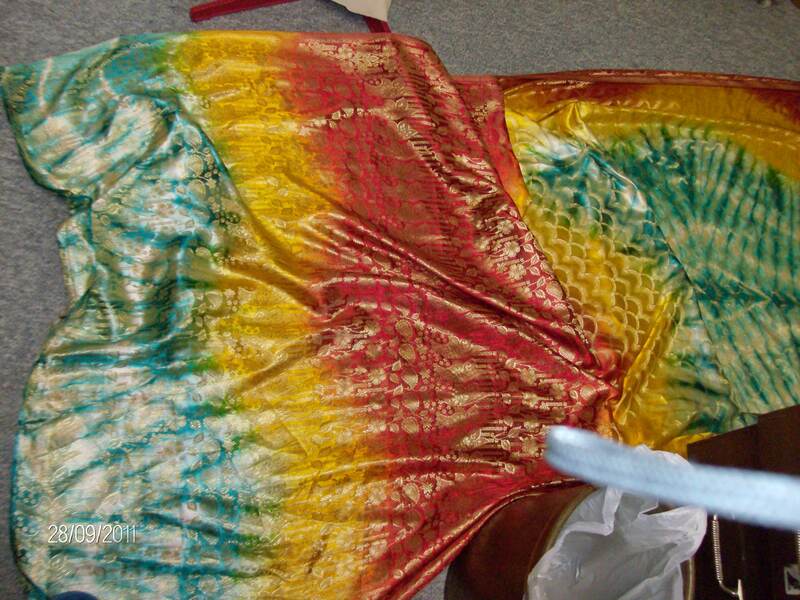 The embroideries were done with a layer of quilt batting under the fabric: it gave the small bag extra texture. Satisfied with that work, I found a zipper (Horrors!! They had no zippers in 1912!! 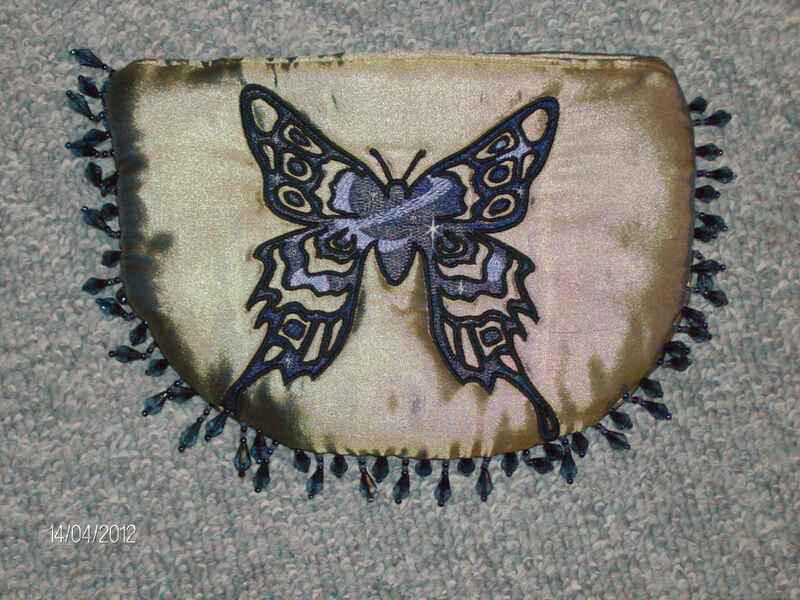 But as I had no fancy bronze clasp and neither did I want to make a flap which would have covered the embroidered insects I went for the next easiest thing to do: a zipper.) and left that day’s work at that. I went to bed still looking for a way to make my inappropriately wide and full skirt into a straight, evening look skirt. Cutting it down to narrow it was out of the question. The other secret about this skirt is that it is actually a pair of very wide pants. My mother had something like this in the seventies. They called them :*Palazzo* pants. Do you remember that? First thing I did Saturday morning was finish assembling the clutch. I sewed some of the beaded trim in the bottom curve of the bag and this made it shine! But what about the skirt? I knew that I should have some kind of sheer and straight front panel. 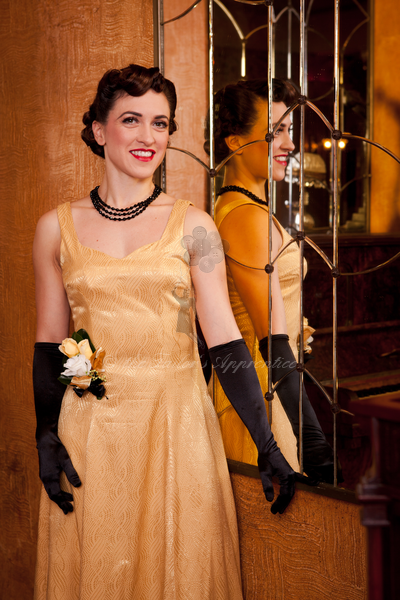 At least that is what I preferred in the look of the many dinner and evening dresses I have looked at from that era! Having a panel like this would partially hide the full skirt. It could hang either horizontally across or diagonally. Either way it would have to be placed so that the butterfly border could be seen. 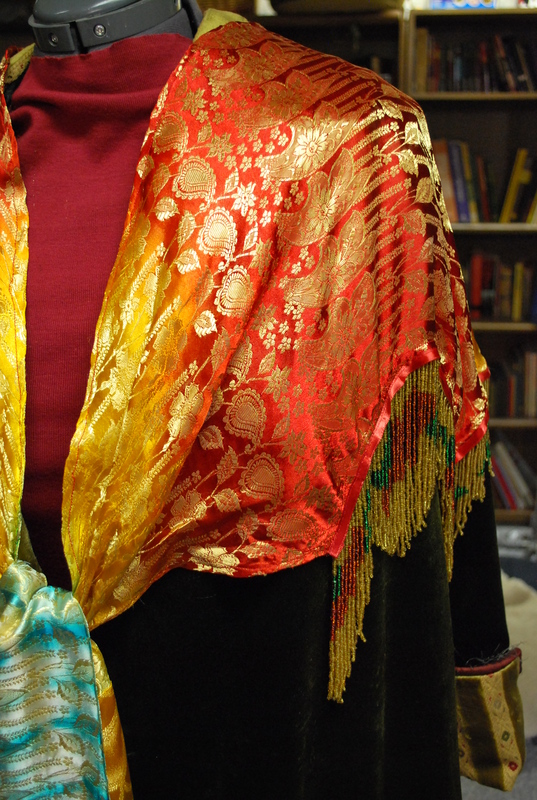 Last night I went in search of fabrics in my treasury… there was nothing that caught my eye. I went to bed feeling a little disappointed. After breakfast this morning, back down to the studio I went because overnight I remembered that I have a box of organzas and other sheer bits that I forgot to check yesterday! No royal blue. 😦 No gold. 😦 Right at the bottom there was an oddly shaped piece of navy blue organza!! Rather scrunched. But upon opening it up, and checking it against myself, I established that not only was there enough but that the diagonal piece it was cut into would be the perfect shape for my *tabbard* of sorts!! I immediately decided that I would add the last of the blue beaded trim I made for the Wrap if there was enough of it… what else can I do? What else? What else would be the last touch?????? There was enough beaded trim. YES! 🙂 And after checking to see if there was enough of that: I cut the last bits of the butterfly border off the remnants and although not quite enough to extend the full length of the hem, I sewed it on to the organza. I will drape and pin to properly settle everything when I get dressed tonight. 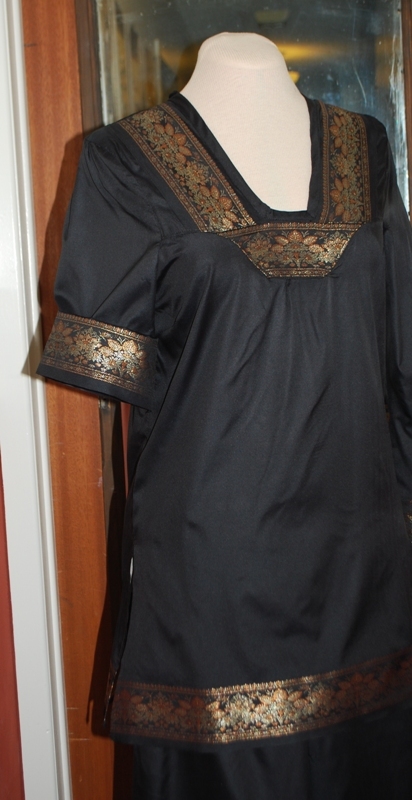 Since the seam between the organza and the satin would show anyway, I sewed over it with gold metallic embroidery thread that matched the gold of the fabric. (I have 10 different shades of metallic gold in my threads!!!) This gave it extra dash. 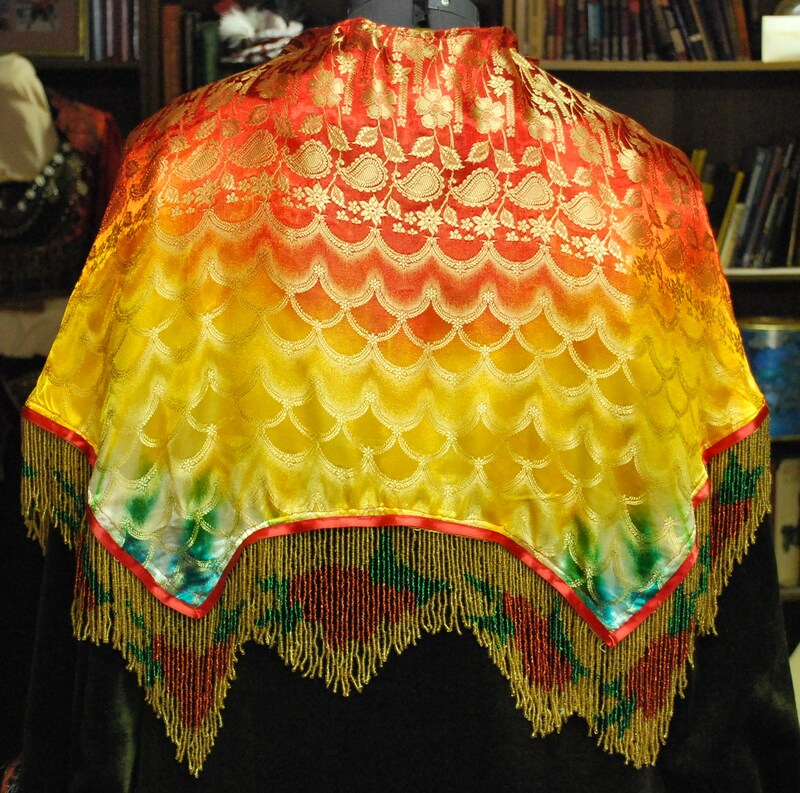 Then I sewed the beaded trim to the very edge of the butterfly border. 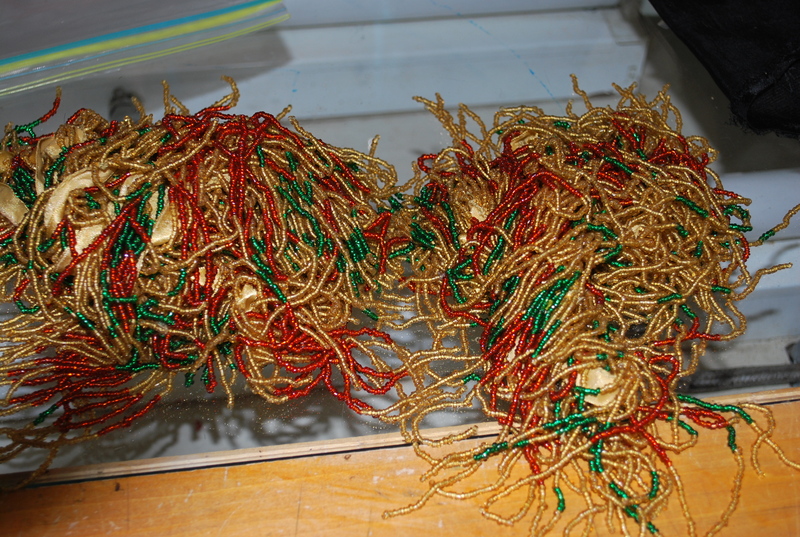 The weight of the beads pulls the overskirt down and prevents it from flying up due to static or other sources. This piece of fabric will wrap over the skirt, creating a flat narrow look and matching the outfit for a proper ensemble look!!! And I still have my wide skirt for summer time!!! I will post pictures of me wearing this outfit later on tonight or tomorrow!! I haven’t been here in almost two weeks! I caught a bad cold, got better then caught a wicked flu that really floored me. Actually, it bedded me, but that doesn’t really mean the same thing, does it? Fever, complete exhaustion and disinterest in anything have finally given way to getting bored with doing nothing . If I’m feeling bored, that means I’m better so I set to work! Late last Monday night, Janyce (from the VPLL 1912 Titanic Sewing Project) asked the Ladies: *Who would like to try the Challenge project?*. It was a Princess Slip. As soon as that email got in my box, I wrote back to her volunteering for it. I actually received the pattern, via e-mail in a .PDF format, the next morning and was very excited and pleased so decided to print it out right away. 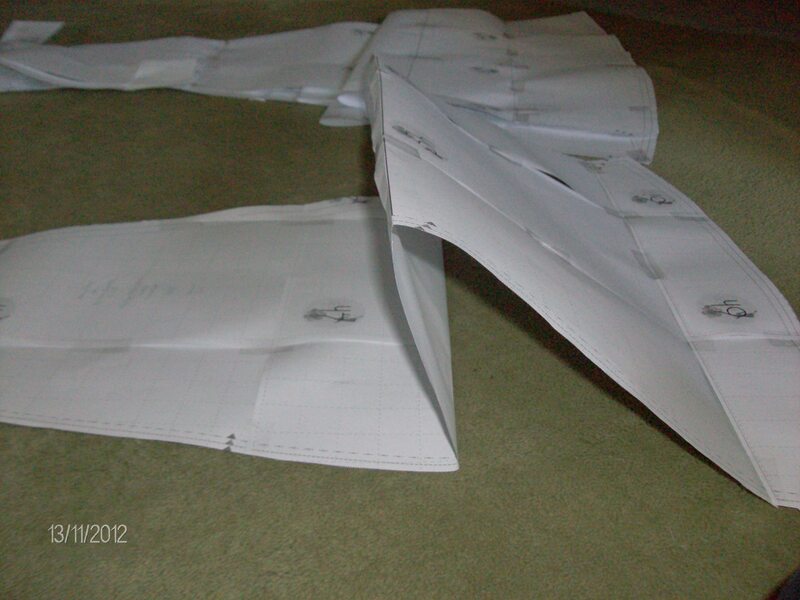 That exhausted me so I went back to bed… after a half hour I decided to re-assemble the 30 pages of print-out into the large sheet containing the 4 pattern pieces: a middle front to be cut on the fold; a side front panel, a middle back and a side back all to be cut twice. It was easy: I figured out that the print-out was 5 across and 6 rows down. The pattern appeared as promised and I set to cutting it out. Then I went back to bed for several days. There is no pattern piece for the pleated flounce at the bottom of the slip as that is just one long, narrow piece of fabric. 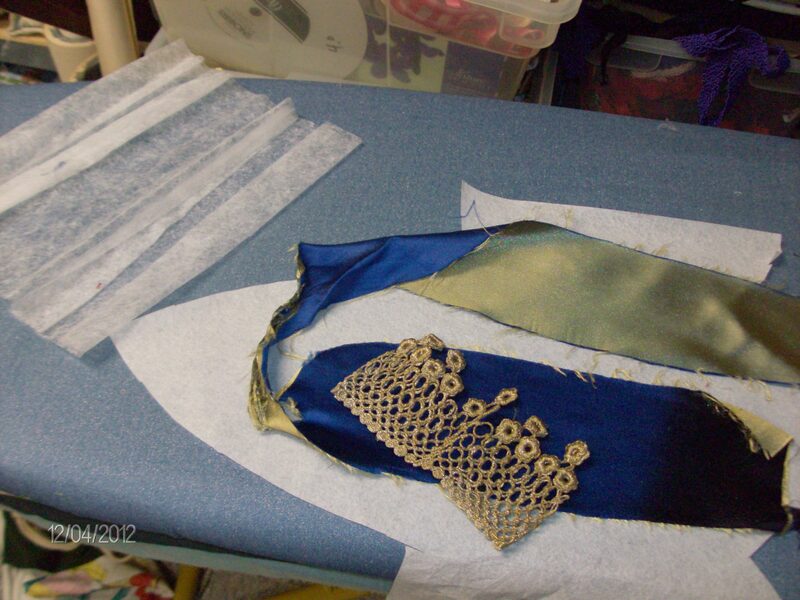 It requires a lace insert as well, to be done before the pleating. Over the next few days, I read the excitement on our Facebook group page as the other ladies who volunteered for this *Challenge* project slowly received their own copies and got to work on their slips. I was discouraged as the weekend rolled around and I still hadn’t done anything. Simply too tired to think… but Saturday, I got up and went to search for the fabric and lace I wanted to use for the slip. An hour later I emerged from my workroom, sweating from fever but excited at what I had chosen. My first choice was to take out some white lining and ivory lace. Since I wasn’t ready to sew yet, I left it on the table to mull it over some more. 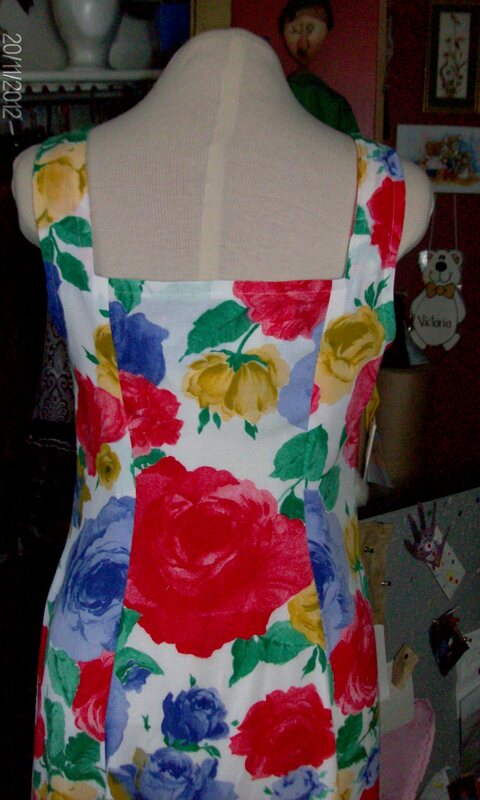 This past Monday I had to finish another project I wanted out of the way and looked at the fabric for the slip again. I was not happy with that choice anymore. So I went back to my stash of favourite fabrics and pulled it down since it needed straightening out again anyway and chose new fabric. I kept the lace I had first seen. 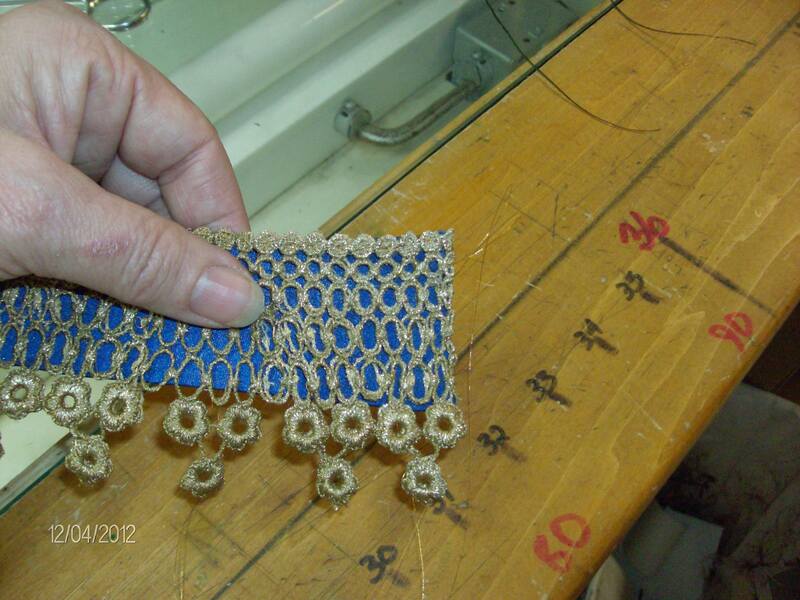 Here is the vintage lace showing it’s 3 patterns. 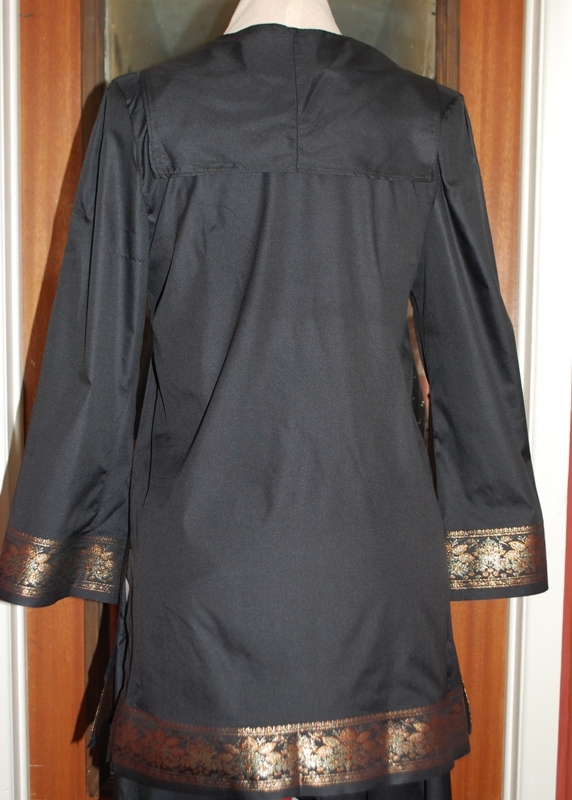 The fabric I used is a crinkled, black flocked black chiffon. The lace is ivory. 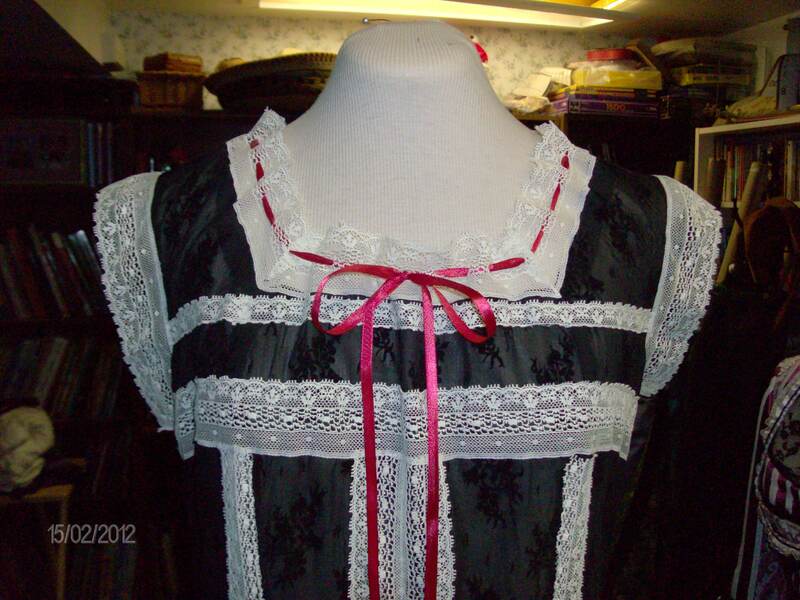 The narrow ribbon around the neckline is scarlet. I mentioned that I read most of the posts the other ladies were writing. Many seemed to be having problems with this pattern. Sizing was a universal concern. So I measured the pattern, measured myself and was quite happy to find out that it wouldn’t need any altering, as the measurements of the paper pattern seemed to fit mine exactly! I made two small changes. I narrowed the back between the shoulder blades by about 2 inches and lengthened the straps by about one inch, while cutting the fabric. In the end, I would say that this is an easy to intermediate skill level pattern. 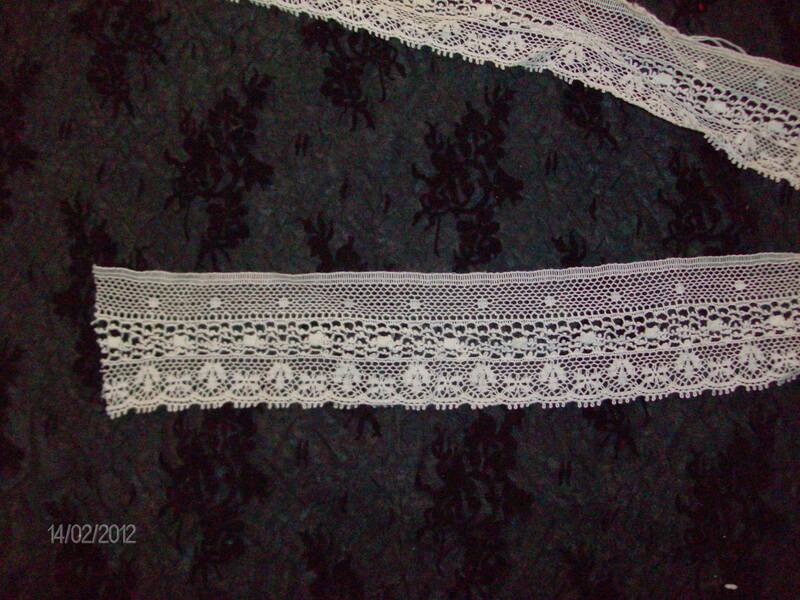 The lace I chose is vintage and 1 3/4″ wide. 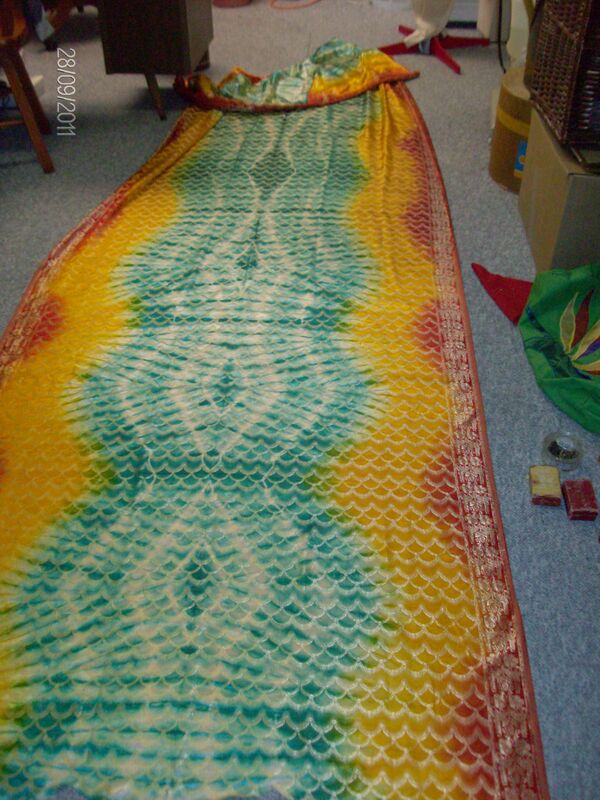 It is woven in 3 patterns across its width. 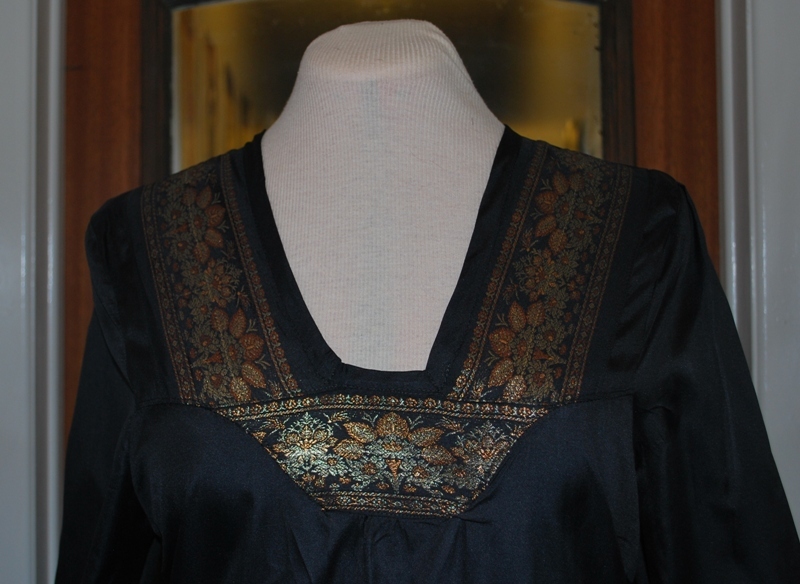 The pattern required some lace 1″ to be used on the body of the slip and some lace 2″ wide for the neckline and the sleeve openings. 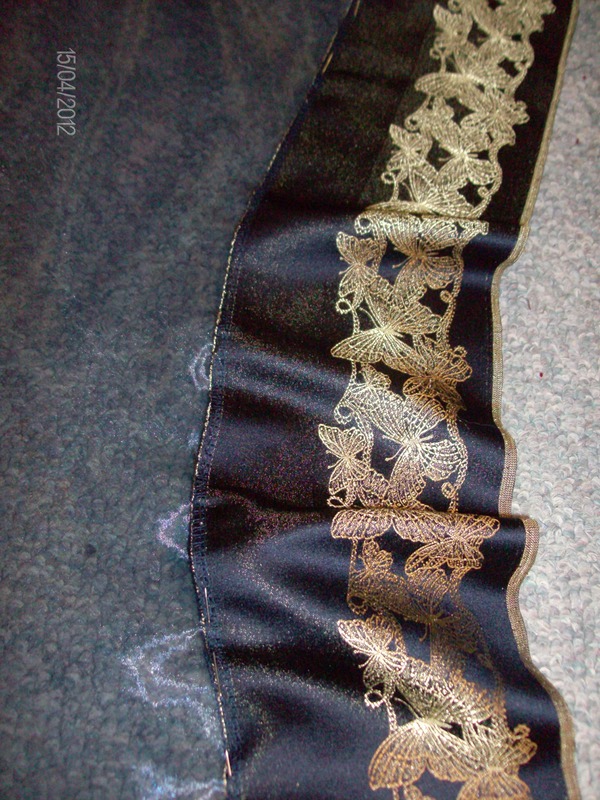 I ended up sewing my lace into two 3″ wide segments, to use down the middle front and middle back of the slip. 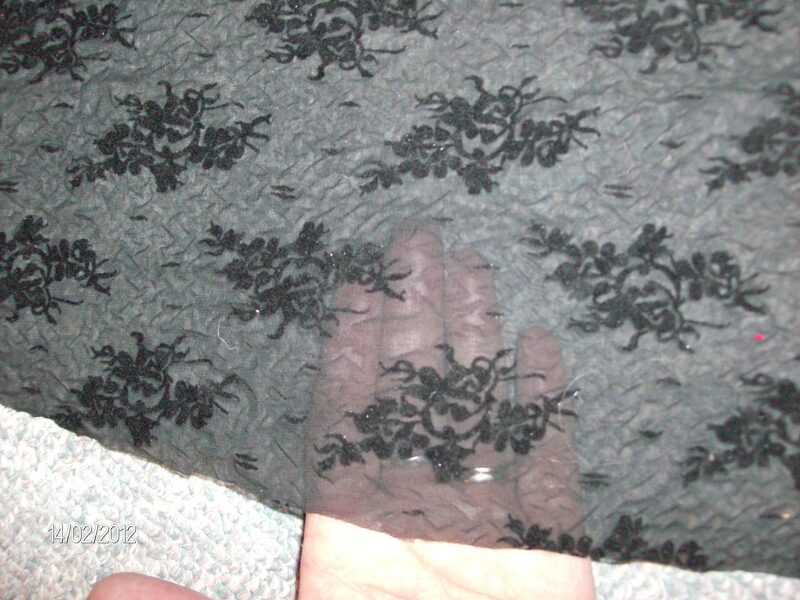 I cut one section off more lace to use down the side seams of both the front and back parts of the pattern. I further cut down the lace to use as a narrow band on the front bodice, to balance out the wider length which I used as the bottom lace insert. Because this slip will actually be a nightgown for me, I didn’t cut out the fabric from behind the middle lace segments: it was very see-through and very wide… and as one of the Ladies wrote earlier, *I was giving away the ranch*. (What a picturesque expression!!! I like it!!!) 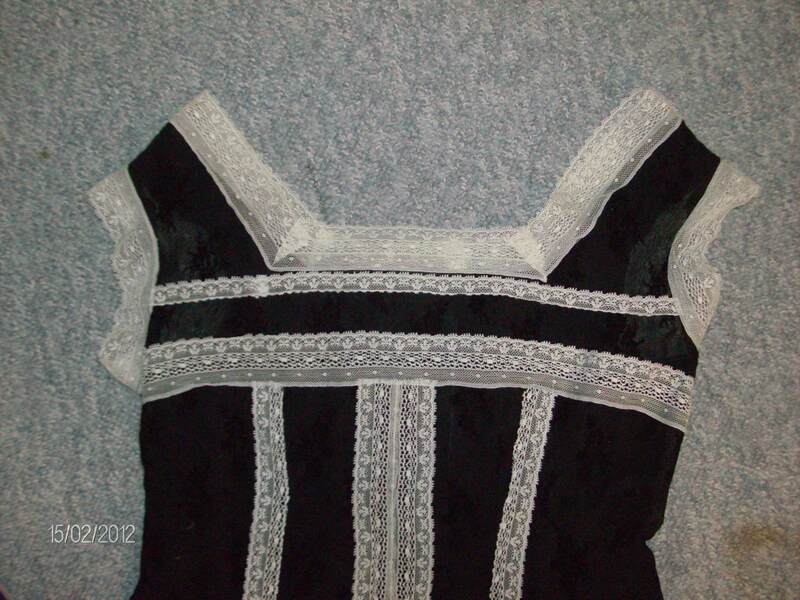 I only removed the fabric from the side seam inserts on back and front, and behind the lace that crosses the bodice top. Inserting the lace is a long job but not too difficult. 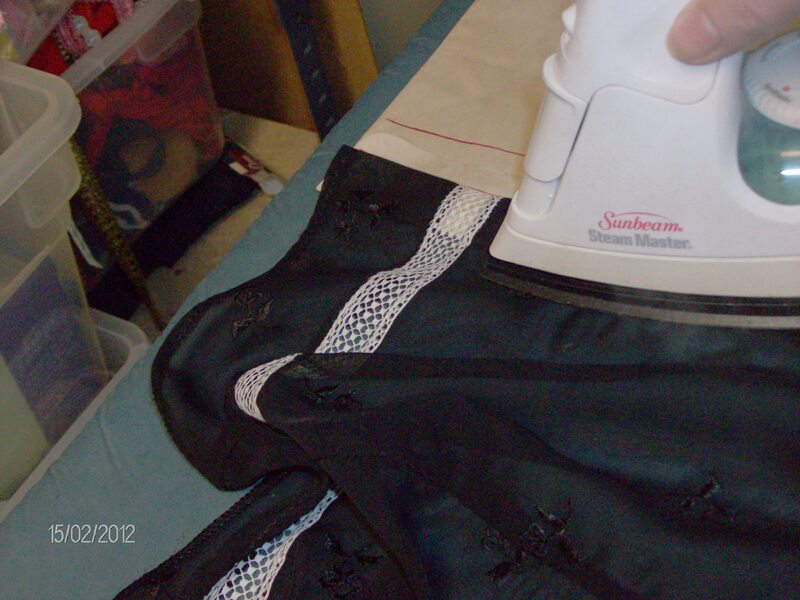 It consists of sewing the lace along the marked spots, turning the piece over, cutting down the middle of the fabric which is now behind the lace, ironing the two flaps to either side of the lace, then sewing down these rolled edges to finish the seam nicely. 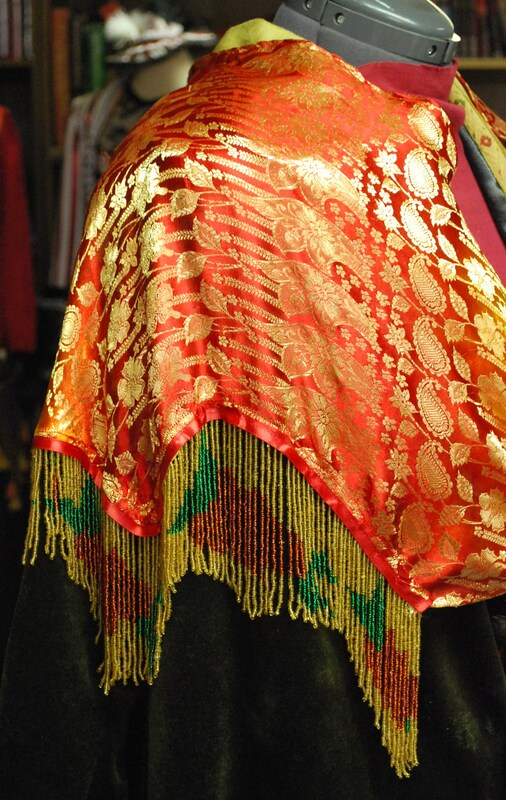 This process emphasizes the lace if it is the same or a close colour to the fabric it is sewn on. 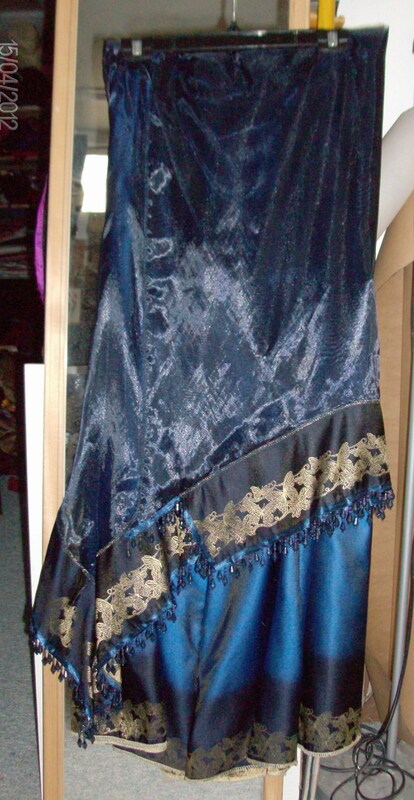 In my case, the lace shows up very well either with or without its fabric backing. Assembling the front to the back was easy once the lace was inserted. 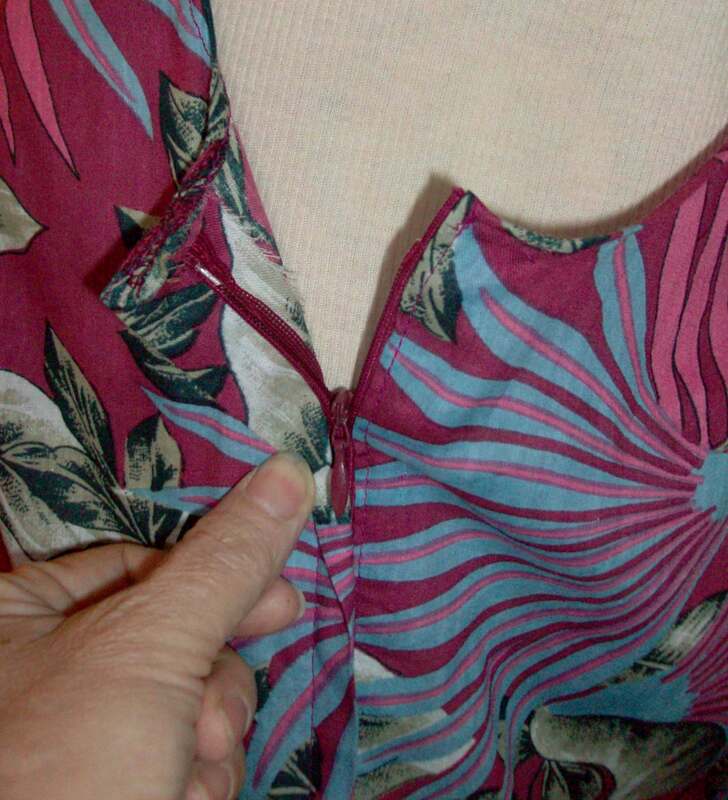 The pattern also called for several buttons to be put down the centre back. Since this is a nighty, I only put one button at the top as I don’t want to be lying on buttons half the night. The next step is to cut the fabric in one long (about 4 metres) rectangle for the flounce. That was done by ripping it to my chosen width of about 12 inches. 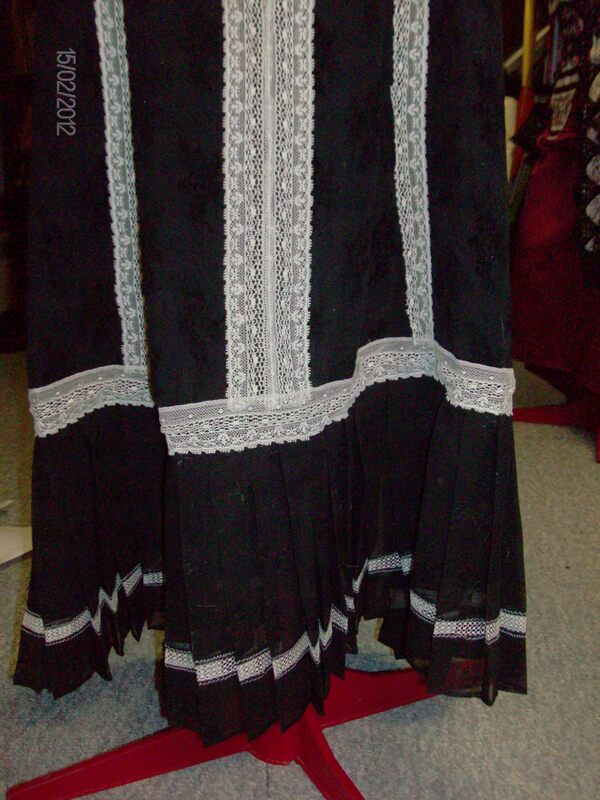 I thought to make my flounce out of a black chiffon embroidered in black. I felt it would be softer than the main fabric and would flow better at the bottom. 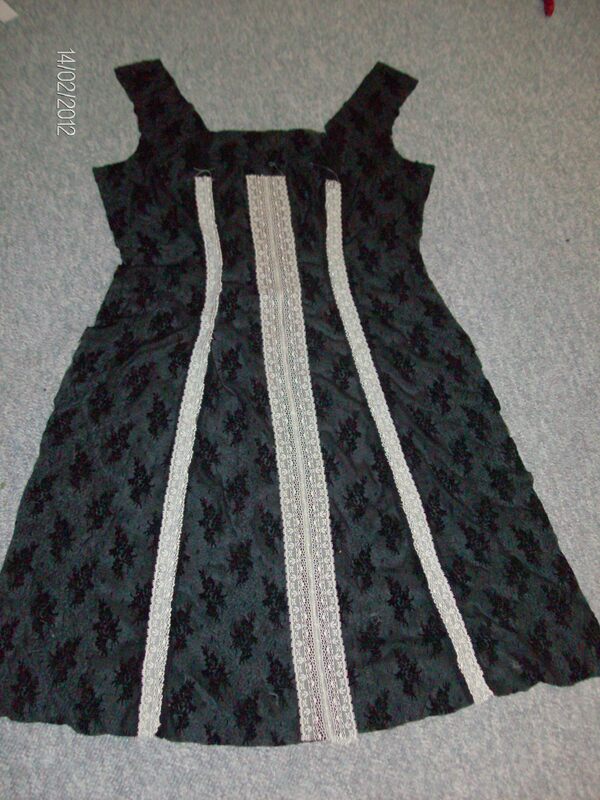 I proceeded with inserting a plainer lace and then to pleat it. The pleats are accordion pleats, with one inch overlapping a two-inch section. This would make the pleats sit without heavy overlapping. It was suggested we read a chapter of this book: “The Art of Manipulating Fabric” by Colette Wolff to learn how to make these pleats. I adapted what I read there to my own needs. 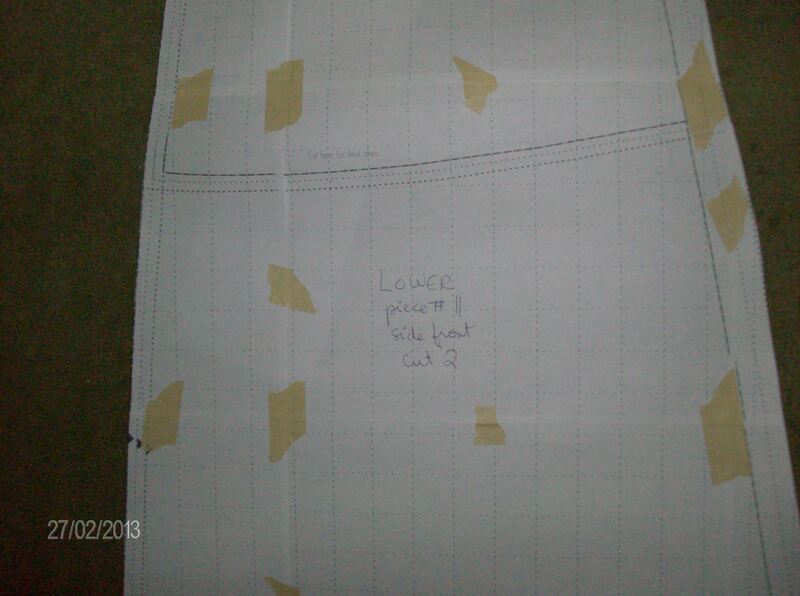 Here you can see the two lines I marked for the pleats. 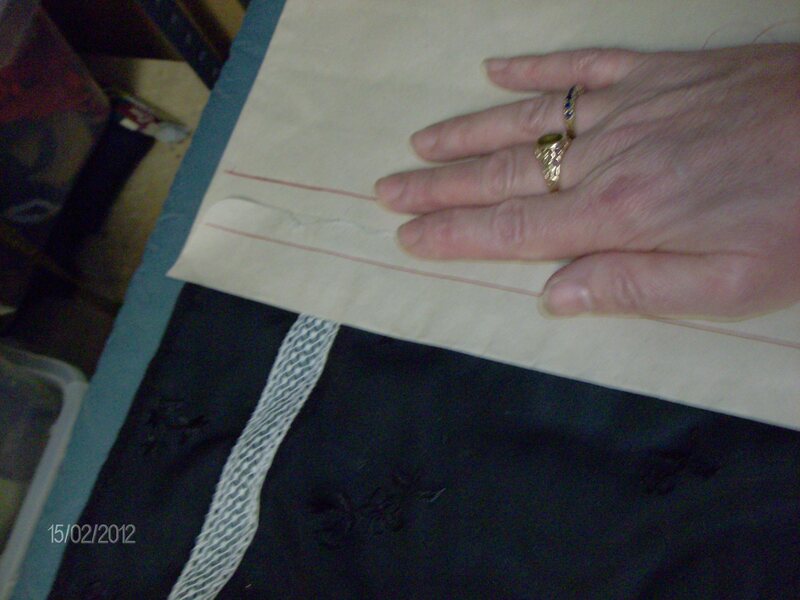 Pressing the fabric over the edge of the envelope at one inch mark. 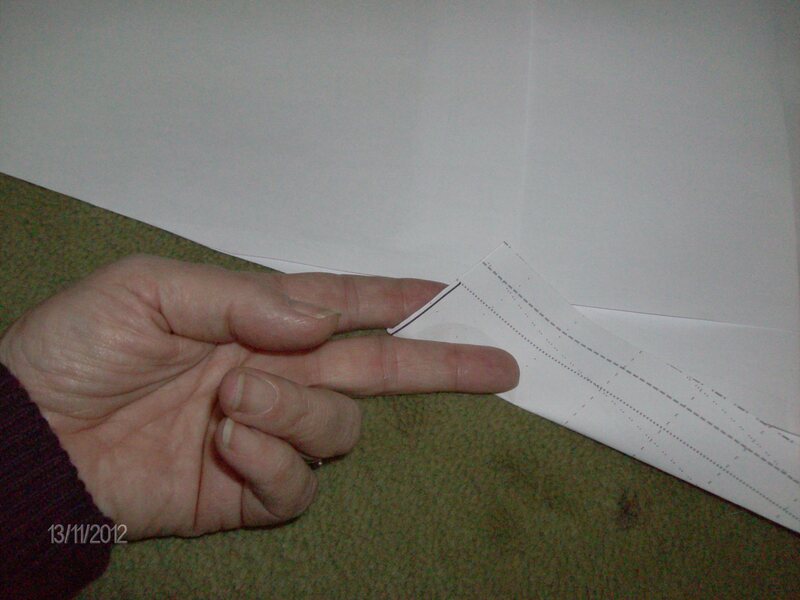 I took a thick envelope and marked a line one inch from the edge, then made a second mark two inches from the edge. That way the fabric could be folded over the edge of the envelope at the one inch mark and pressed. 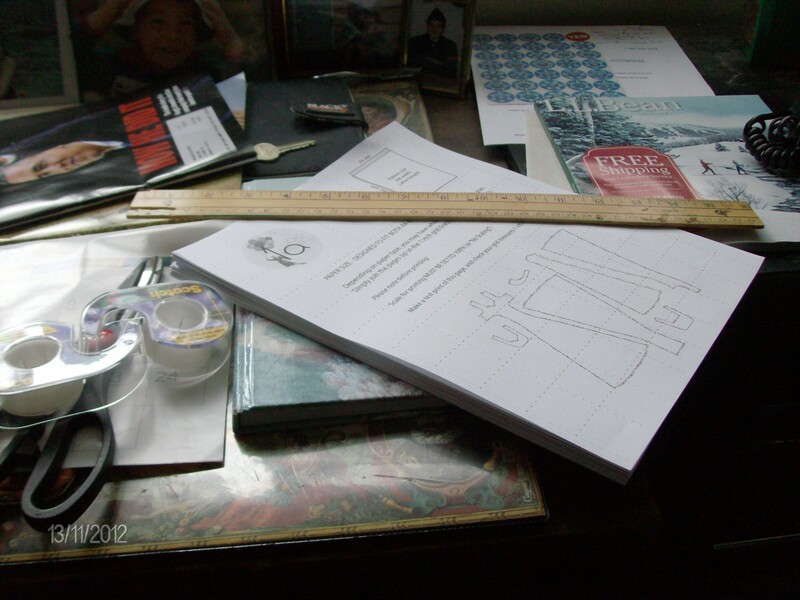 Then I would align the 2″ line to the (just made) pleat’s edge, weigh it down and bring the fabric over the envelope again and fold it back at the one inch mark. This way the pleats were being kept nice and flat under the paper and not getting ruined or in the way of making the new pleat. Every 10 or 11 pleats I would press the fabric directly and pin one edge of the fabric to hold the pleats down until all of it had been pleated. Then I basted across the top of the flounce in order to make the pinning of the flounce to the hem of the dress easier. 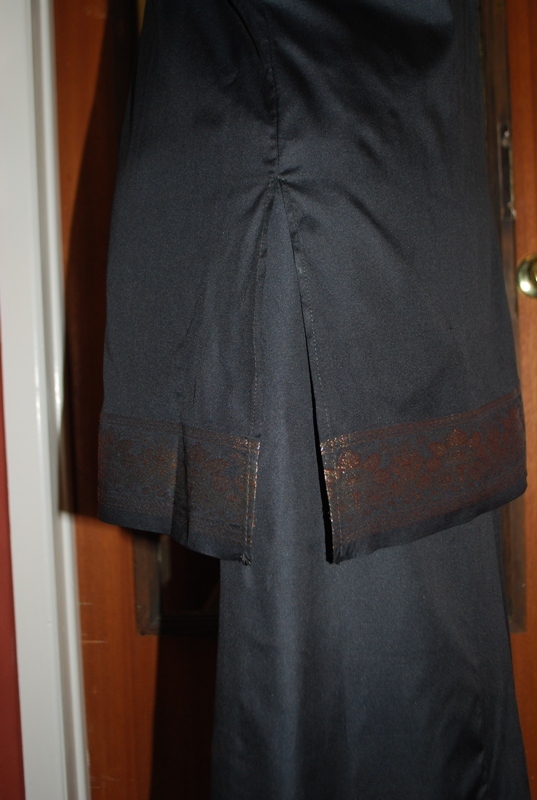 This picture shows the pinning of the pleats on one edge. 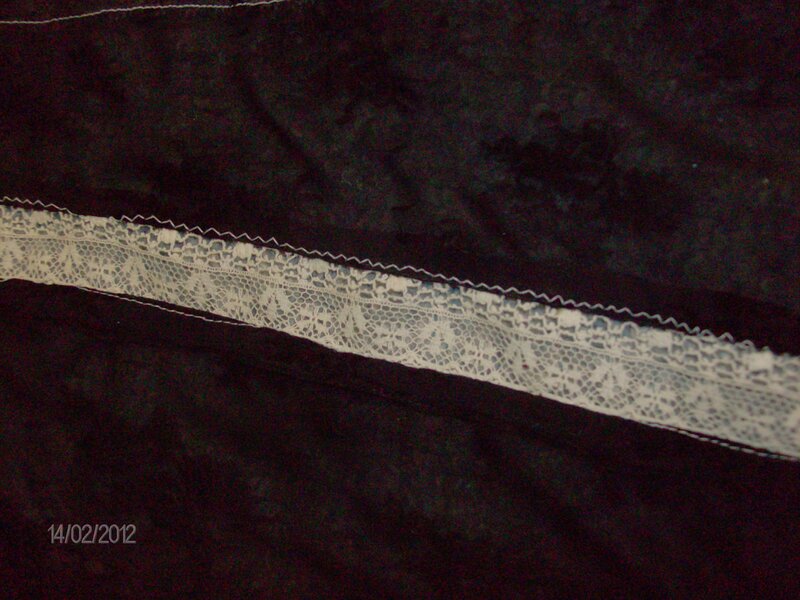 After the flounce was basted on, I overlayed another piece of the lace and sewed it in three places. 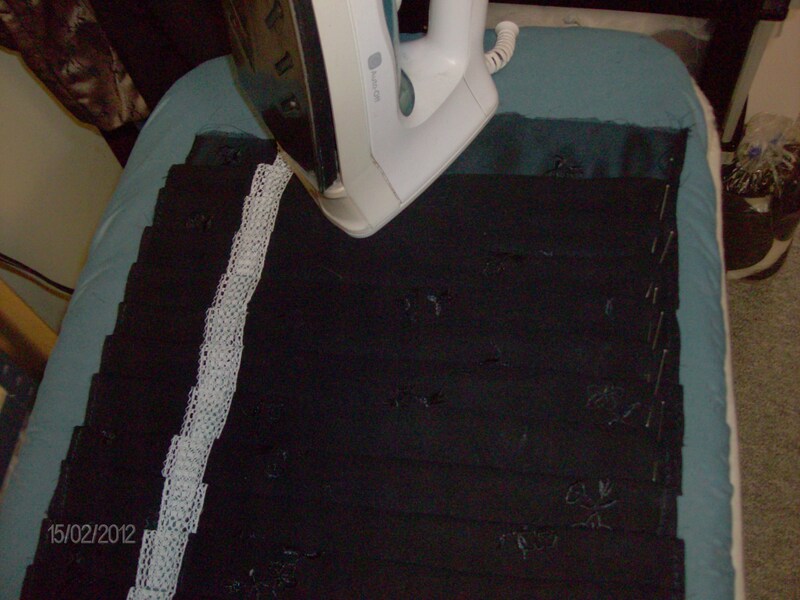 This allowed to keep the pleats well flattened and when I wash the garment they will fall back into place much better. 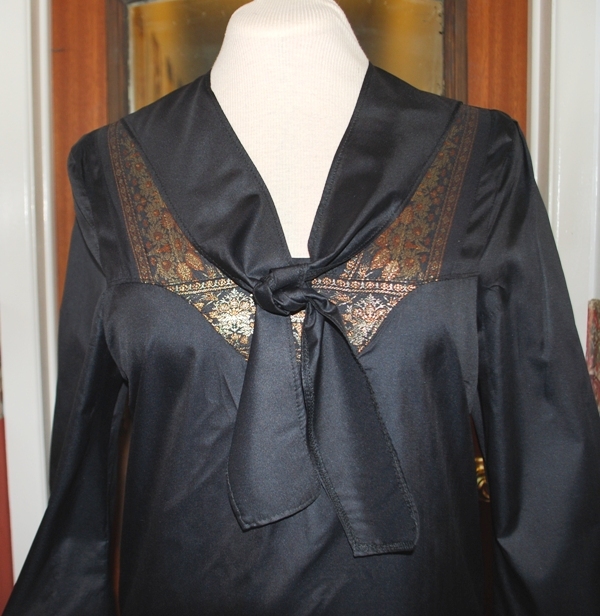 The last thing to add was the red ribbon, woven into the lace at the neckline. I chose the scarlet because it just felt right to me. 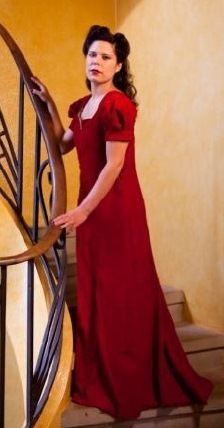 The neckline is emphasized by the scarlet ribbon. Front of the finished Princess Slip. Back of the finished Slip. 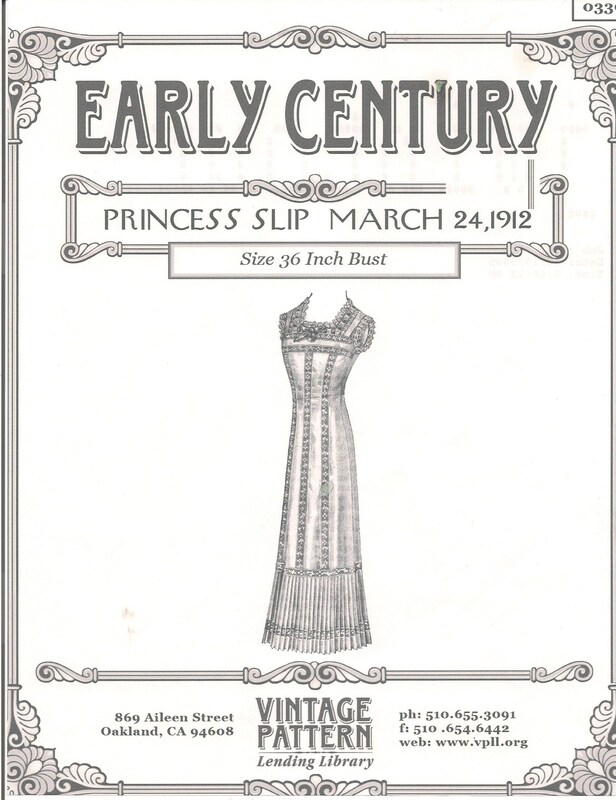 A Princess Slip from 1912. 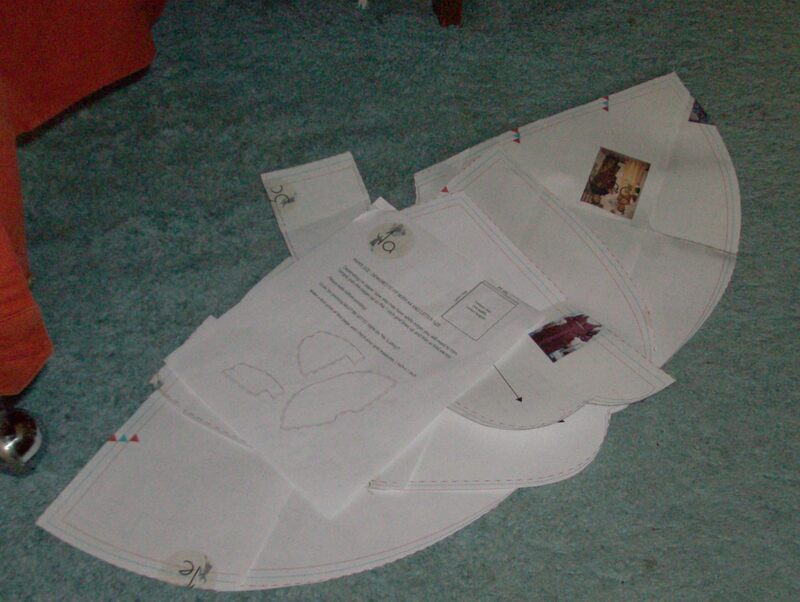 The count is now just over 400 members for the VPLL 1912 Sewing Titanic Project. We have been divided into 35 groups. Three patterns were sent out to the first lucky three groups… I was not in any of those. So the wait for that is stretching out some more. 😦 We were told a fourth pattern will be sent tomorrow Friday: Gr.34 may be the one to get it! 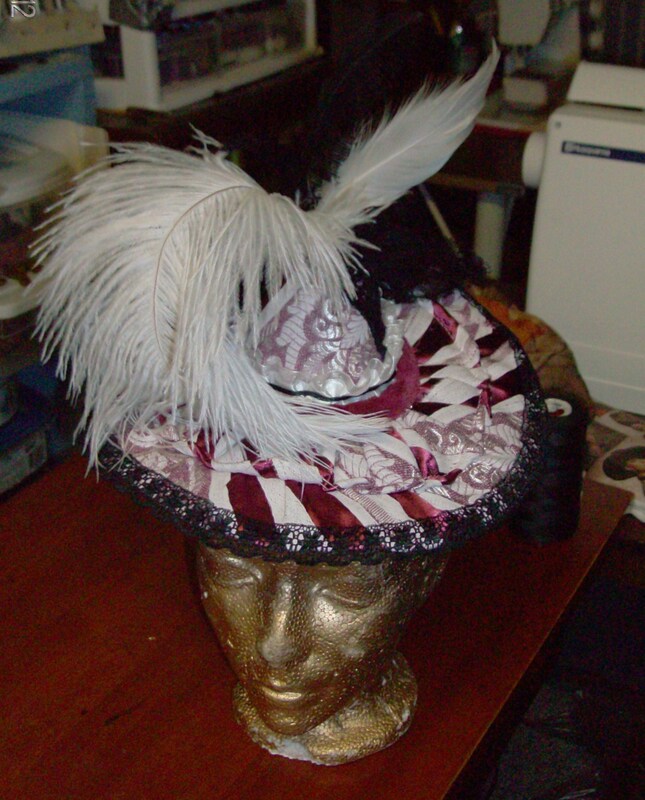 I had a wonderfully productive day yesterday… finishing many little projects that were abandoned as important work came in and sometimes left because more exciting things drifted along… So yesterday I added one Ostrich plume to the Little Hat and what a difference! I have been learning how to shape and work the feathers. My friend thought one of the smaller plumes would be just right for the Little Hat. She was right. It is now ready to meet the world! Now that the White and Magenta stripe Steampunk outfit is finished, my mind has gone to transforming an 80’s jacket into a newer shape. 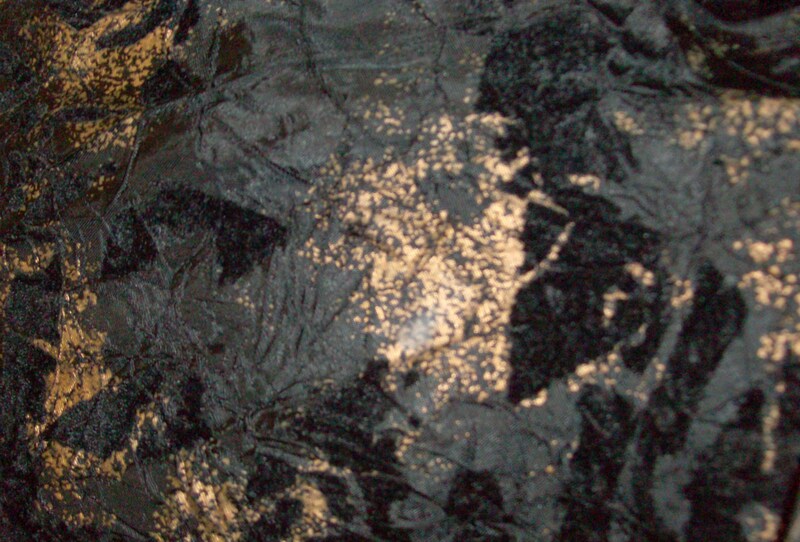 It is wrinkled black printed with gold *splotches* and further textured with black flocking. 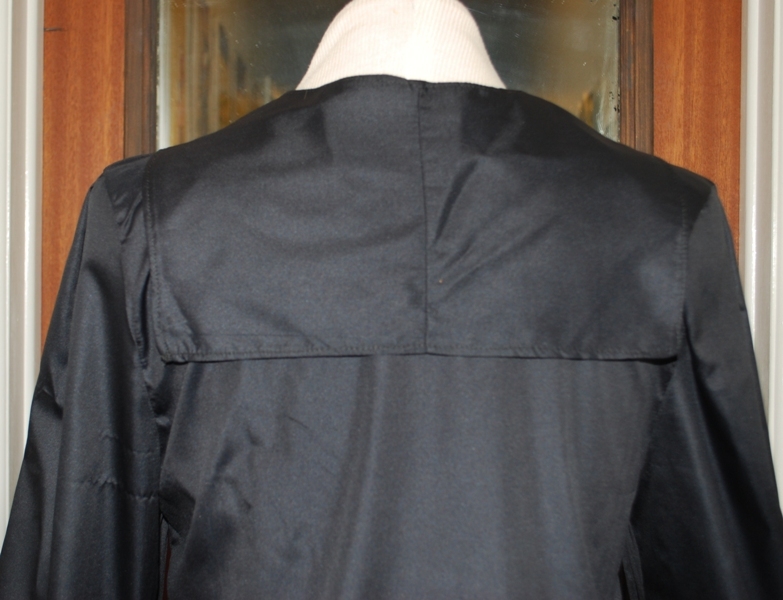 I have already removed the gigantic collar and some lining. 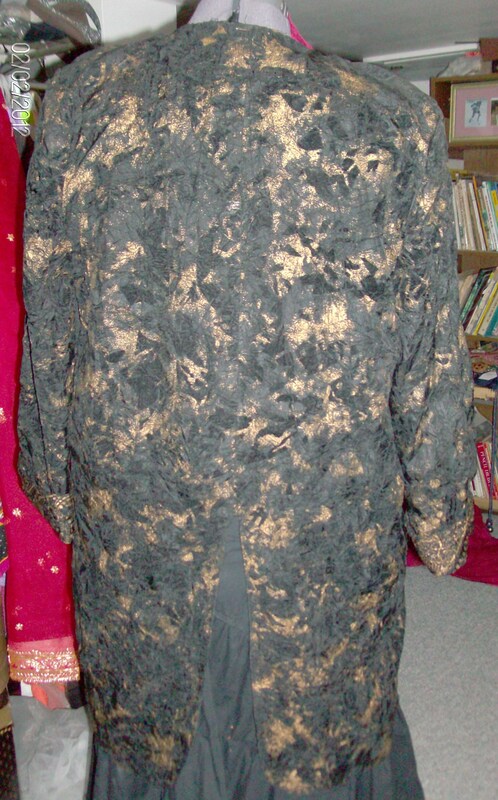 The lapels are also very wide and have a paisley gold print on them… they are still there while I decide to keep them or not. 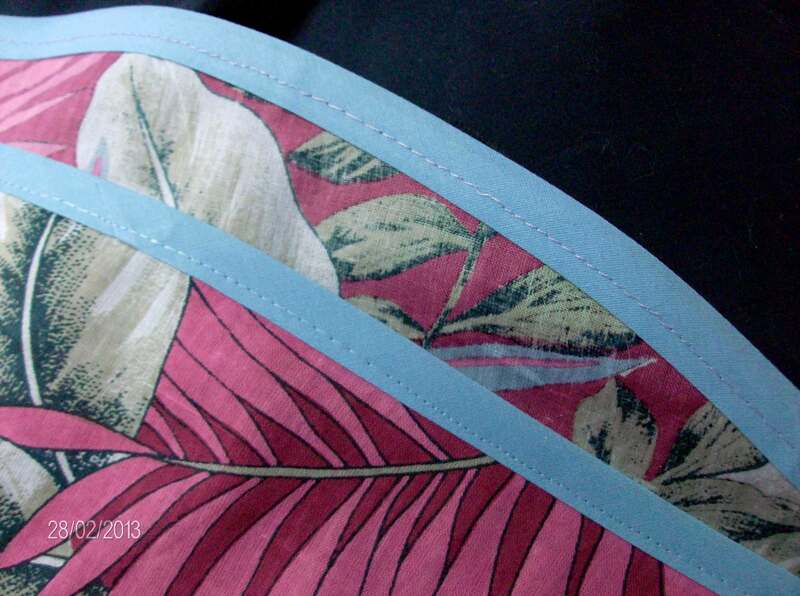 The same fabric is used as the cuff fold-over lining too… Just not sure about that part yet. I can’t decide whether to make it Steampunk or more ordinary for daily use. It will be machine embroidered with some new designs found earlier this week: an octopus, a swallow and some gears, which are definitely Steampunk oriented… the embroidery will be done in a matching gold thread so it will stand out better. I’m thinking across the back at shoulder level and perhaps some at the bottom hem front, maybe the sleeves. I really like the way it is separated into two tails at the back. And it will certainly need reducing in size and tapering at the waist: it was made for the huge shoulder pads that completed the very boxy look of clothing and were so popular in the mid to late 80s. A major overhaul for sure!! 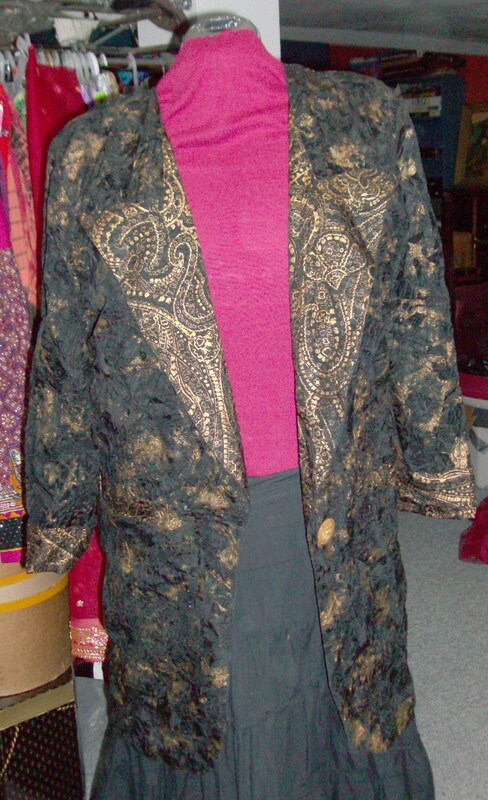 There is a black bustier in my stash of clothing for remodelling that will be a good match for this jacket. 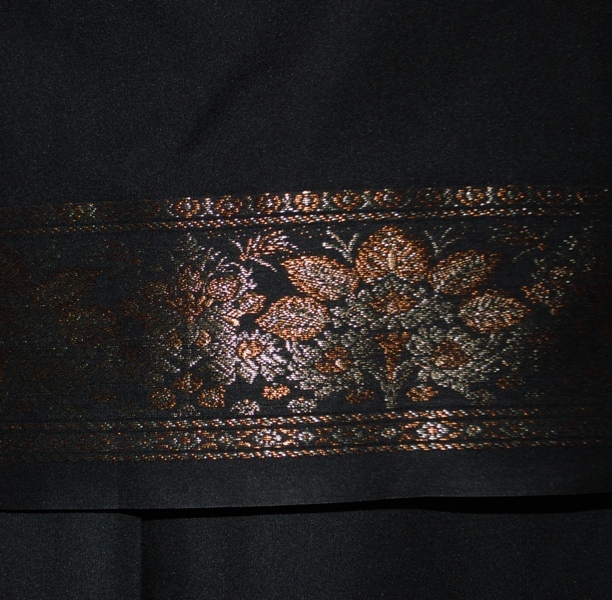 It has some beige embroidered flowers and leaves along the panels between the ribbed boning seams. I have already started that to better fit me as it was a little small in the cups. So the delicate embroidery on the black netting was removed from the original cups and I refitted the bustier with my own size cup then sewed the embroidered black net back onto them. Now I am deciding about outlining the boning seams or not. 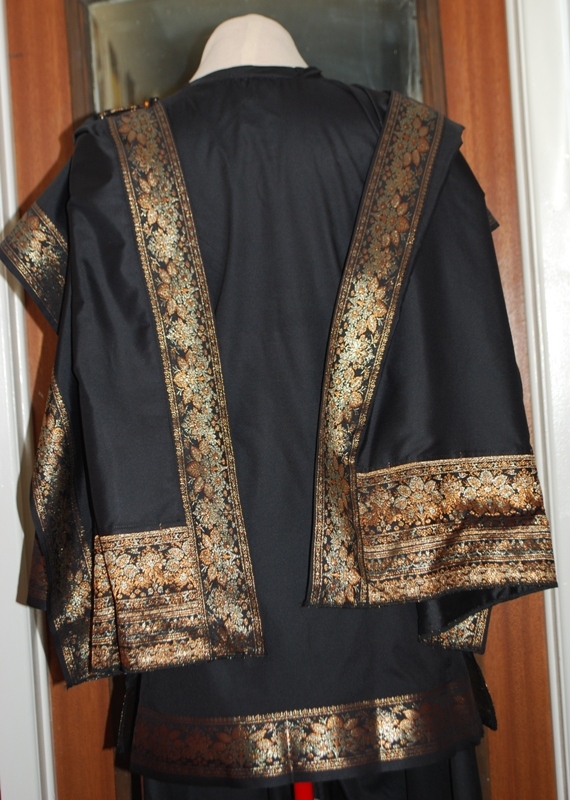 I have a nice black and metallic gold braid that would be a good match and make the ribbing stand out better. Adding all this detailing would make the bustier more formal, dressier and definitely more *costumy*. The question is: should it become a costume for sale or remain a piece to add to my (already bulging) closet? Which brings me to another job which should be done soon: slimming the closet. Yes, there definitely are (too) many clothes in there!! I am quite guilty of loving clothes, especially for summer: bright, colourful, soft skirts mostly. It’s not to have clothes: it’s because I love the fabrics and the colours so much!! I want to have every colour and all the soft textures I come across!! That means a lot of t-shirts and tops needed. I rarely buy anything full price as I make most of my summer clothes… so there isn’t a large financial investment in there!! Making my own clothing has led me to having tons of it. Opening my closet doors is like opening the doors onto a rainbow! 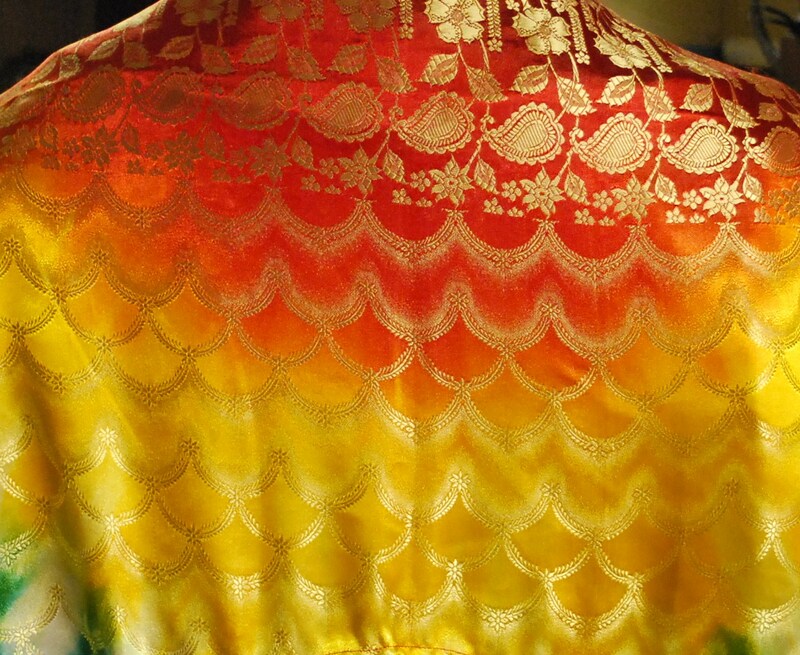 A frothy, soft, silky or rayonny rainbow! 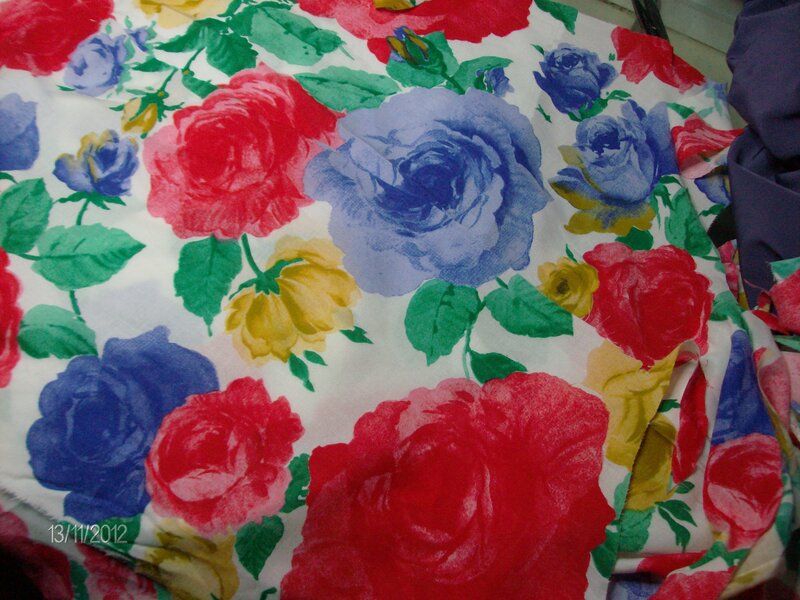 Cotton is usually too crisp, linen too: most of the skirts, dresses and tops are either silk or rayon. 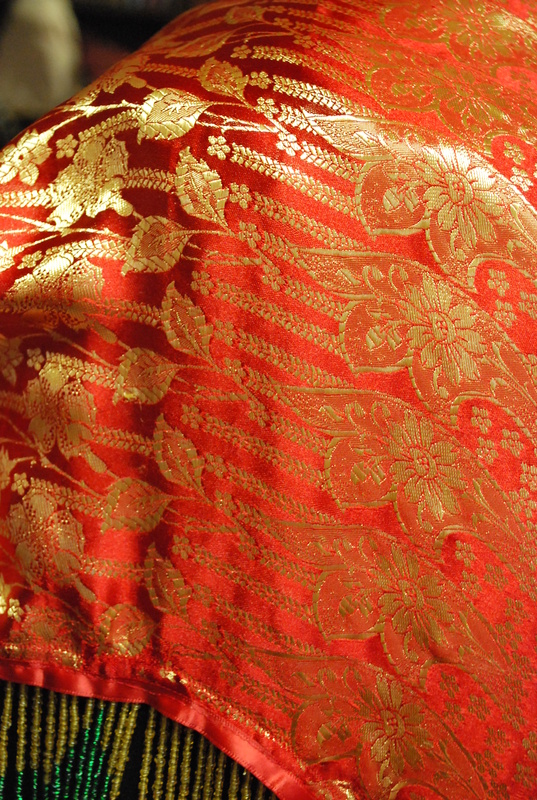 These fabrics drape so gently and just take colour so well!! My lovely deep, saturated, juicy colours that make me so happy!